I loved The Kiss of Deception so much – it was one of my favorite books of 2014 – so I was really nervous to start The Heart of Betrayal, worried it wouldn’t live up to my expectations or would have Second Book Syndrome. It picks up right where The Kiss of Deception ended, plunging the reader right back into this amazing world. Despite the slow pacing in the middle of the book, this was an overall enjoyable read. Lia is filled with sass and fire. Despite everything that happened to her, she remained strong and fierce. She’s determined to play the game and deceive the Komizar, ensuring Rafe’s safety and their freedom in the process. She played the game so well, I almost started to ship her and the Komizar! Though she falls apart a few time and she has some unlikable moments, she has a lot of growth in this book. And that evil cliffhanger…!!!! I NEED book three, like, now! When I reviewed The Kiss of Deception, it was hard to talk about Rafe and Kaden, since their identities were a mystery (as far as which was the prince and which was the assassin). If you read that review, though, you know that this back-and-forth guessing game left me confused and frustrated and actually distracted me from the overall story. 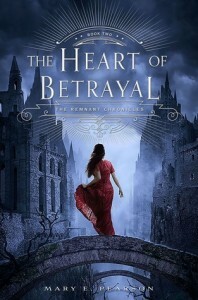 Going into The Heart of Betrayal, I had a lot of trouble remembering which guy I liked from book one and why because of the left-over confusion. So, because I couldn’t remember anything about my feelings for them from book one, I had to rely solely on how I felt about Kaden and Rafe based on their behavior in The Heart of Betrayal. I’m pretty sure I liked Rafe more and shipped him with Lia in The Kiss of Deception, but to be honest, his chapters in The Heart of Betrayal bored me. And at times, I really shipped Lia with Kaden more. But they both had their moments of bad behavior and I almost got to a point where I didn’t ship Lia with EITHER of them. By the end of the book, I think I was back on Team Rafe – and I say “think” because I’m still not sure how I feel about certain things. Some of my favorite characters – as was the case in book one, as well – were Pauline and Gwyneth. They’re hilarious together and I really want to see more of them! I actually really liked Calantha, even when she was being evil and manipulative. There was something about her character that intrigued me. The revelation of who she is was pretty epic. I also really liked Aster and my heart broke for her at the end. Finally, I really liked Griz and Eben, though it took me a while to remember who they were from book one. And that leads me to the parts that were confusing… I barely remembered anything about the “ancient” characters from book one, so whenever they came up, it slowed me down while I tried very hard to remember. I think a “Who’s Who from Book One” character guide would have been helpful. And maybe a short page or two on the “History of Morrighan, Venda and Dalbreck.” I couldn’t remember who Gaudrel was from “The Last Testaments of Gaudrel” and it took me a long time to remember the history of Morrighan and Venda. As I’ve mentioned a few times, the ending was an EPIC INSANE CLIFFHANGER OF INSANELY EPIC PROPORTIONS. I can’t even wrap my head around it and I finished reading it like a week ago! The ending almost makes up for the slow pacing and confusion in the middle of the book. I’m very excited for the third book and can’t wait to get my hands on it to see what happens next!!! I loved this one, but we have some different feelings towards the characters. I love Rafe & Lia together, and definitely don’t want her with Kaiden. I also never liked the Komizar. The ending definitely was awesome and I can’t wait to see what happens!